StarRaptor, good call. But I think the UME's are pretty much the same as the LME, only in smaller portions, ment to compliment the MB HME's. My biggest fear over this whole thing is interjecting Too Much Information too soon. That's not to say I don't want to address things, but as a new brewer perv's thru the list, there is a bunch of new information tweeking their head. Their heads hurt already. So I'm just wanting to give them a small smack to the head. Still looking good! Though one little thing: when you're talking about boiling the hops, the third section should mention that it's talking about aroma. The graph did, but the text doesn't. Thanks... I forgot the word Aroma... you'll find it there now. I'm updating it again. what a great reference guide for us new guys. Thanks Yank! So, if I understand tip #10, you can boil hops for either bitterness, flavor or aroma, but not more than one of those? Great post - I gained quite a bit of info from it.... Thanks. That is why there are multiple additions of the Hops during the boil. Someone post the hops boiling graph. That graph explains so much in such a small graph. Cool thanks. I think the graph along with the words helps to make more sense to someone just reading about boiling hops. 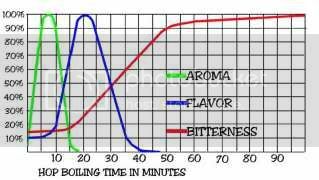 As you can see from the graph yankeedag posted, there's a curve for each, so when you boil for different times, you can get a combination of bitterness, flavor and aroma. You get some bitterness boiling even for a short time, and you get more as the time goes on. I'll sometimes take a bit of a shortcut and do two boils, one for 30 minutes (where flavor and bitterness intersect) and one for 15 minutes (where flavor and aroma intersect). Excellent post! Thanks for taking the time. This newb certainly appreciates it! ...All this is lesions learned by many. Take this information for what it is worth. Learn from others, or re-invent the wheel on your own. It’s YOUR Beer. I have a question on boiling. The Mr. Beer directions say to bring water to a boil, then turn off and add all ingredients. My next batch will have hops, should I boil the HME and UME with the hops? I know your guideline gave times for hop boils, but the basic directions don't give any instruction on it. I am going to make the Full Moon Marzen next. You can boil UME to facilitate a hop boil schedule. But do not boil HME. HME already has hops boiled to spec and if you boil the HME further, you will change the hop profile. nah, that's the noise the spoon makes with the pot boils over and you drop your spoon to life the boiling pot. If you're planning to do a hop boil with UME/DME, what is the process? Bring water to boil, add DME and hops, boil for appropriate time? Or add DME to (non-boiling) water, THEN bring to boil, add hops and boil for appropriate time?